On Sunday 3rd November the club is holding its annual firework display at The Bury. As usual there will be a licensed bar and BBQ. 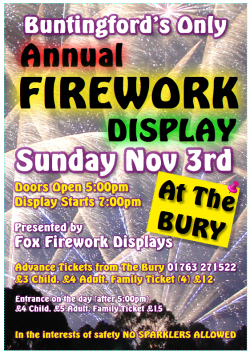 This year the display will again be performed by locally-based Fox Firework Displays - it should be a great show!Discounted tickets are available in advance from the bar at The Bury priced at £3 per child, £4 per adult or a family ticket for four at £12; call 01763 271522 now!